There are two Norwegian bands called Helheim. There is also a German Helheim, who released just one demo in 1995 and split-up afterwards. The first Norse Helheim, founded in 1992 and disbanded in 1996, played industrial black metal and released three records: the 1994 demo "Helheim", the 1995 demo "Walpurgisnatt" and the 1996 EP "Fenris" The story of the second (more famous) Helheim also started in 1992, when V'gandr and H'grimnir had the mutual idea of creating extreme metal music. The first Norse Helheim, founded in 1992 and disbanded in 1996, played industrial black metal and released three records: the 1994 demo "Helheim", the 1995 demo "Walpurgisnatt" and the 1996 EP "Fenris"
The story of the second (more famous) Helheim also started in 1992, when V'gandr and H'grimnir had the mutual idea of creating extreme metal music. But metal cannot be made without someone to fill the drumchair, and soon after Hrymr came along to complete the band. Already from the very beginning Helheim had high ambitions, and even without much experience they weren't afraid to enter the stage. They played several festivals in Bergen just to get live experience from the start. In the mid of 1993 Nidhogg joined Helheim, and now they felt a demo should see the light of day. 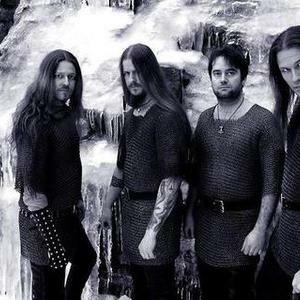 The summer went by, and in the fall the same year they released their debut demo simply entitled "Helheim". The demo never made its way outside the borderlines of Norway as the band realized that the released material simply wasn't good enough. Soon after they started writing new and more innovative material for their upcoming demo. It was at this point Nidhogg left the band as he wasn't willing to sell his soul to Helheim. In mid 1994 "Nidr ok Nordr liggr Helvegr" (Netherwards and Northwards lies Helheim) saw the first ray of light, and it was at this point that the german label Solistitium records (now Millenium music) got in touch with Helheim. After the return from the tour Helheim immediately started working on new material for the epic follow up "Av Norr?n ?tt" (Of Norse Lineage) which turned out to be very different from the debut despite for the fact that both werel recorded in Grieghallen. In 1999 Ars Metalli got in touch with Helheim for a one album contract. Even though the label were of a highly underground character Helheim still decided to give them a try. It was at this point Lindheim (synth) and Thorbj?rn (lead guitar) joined forces with the band to strenghtening the circle. In search of a different sound they went to the fresh producer Odd Kronheim in S.J.E.F. studio and recorded the MCD "Terrorveldet" (The realm of terror) and the full lenght "Blod & Ild" (Blood and Fire), which both harvested really good critics in the world press. Helheim also took the brave move in recording a music video for the track "Jernskogen" (The Ironforest). In 2001 the MCD "Helsviti" (Hels punishment) was recorded, this time Helheim returned to good old Pytten in Grieghallen to once again make history. Unfortunately the MCD was not to be released on Ars Metalli since they somehow stopped communicating with the band. The next move from Helheim was the full length Yersinia Pestis, once again Recorded and produced by Pytten in Grieghallen. Massacre records took the responsibility of releasing and promoting this album. The album got fantastic critics, but did not sell as much as previous albums outside of Norway, much due to a lousy promotion job done by Massacre. But, neverthekess, the album proved to be the major breakthrough for Helheim in Norway, an important issue for the band. Massacre also signed a contract to Release the MCD "Helsviti" from 2001, a promise they chose not to keep. Unfortunately Lindheim chose to leave the band in 2005. Helheim applauds his contributions which can especially be heard on Yersinia Pestis, where Stones to Burden is a proof of his skills. In 2006 Helheim again has a new album on the stairs, "The Journeys and Experiences of Death". This time a concept album regarding the death cults and the belives the Vikings had surrounding death is presented. The album is a continous travel through some of these visions. For the 2000 first copies, the album is sold as a Double Digipack with the MCD "Helsviti" as a bonus Disc. The local record label Dark Essence Records believes in Helheim, and Helheim believes in Norwegian forces, so hopefully this cooperation is the perfect match. In 2008 Helheim released Kaoskult, an appraised longplayer. The year became the so far most active year for Helheim; One Norwegian and Two European tours, several gigs in Bergen and various European festivals. Helheim was also granted lots of worldwide attention when releasing Kaoskult with an accoustic concert in Klosteret kindergarten under the slogan "Odin needs to catch the kids before Jesus does!" Helheim means "the home of Hel". Hel is a godess, daughter of Loke and the jotungiantess Angerboda. She's also the sister of The Midgard Serpent and Fenris. She was condemned by the gods to rule below and to welcome all those who died of either sickness or old age. Helheim, or just Hel, consists of nine levels, but the levels do not have their own names.